Long, slender vines of the Wax Plant are covered with thick, green leathery leaves. The leaves are sometimes flecked with silvery or creamy white. To show off its thickly-leafed vines, and to give them a denser appearance, loop them around a wire hoop or small trellis and tie loosely with florists wire. 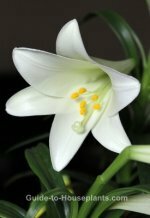 Given enough light, Wax Plant will produce parachute clusters of star-shaped, white to pink flowers with five-point centers. Those flowers are so intricately detailed, uniformly shaped and shiny, they're sometimes called Porcelain Flower. You can expect Hoyas to bloom in the spring, summer or fall, depending on the variety. You'll find lots of H. carnosa cultivars for sale. 'Krinkle' has wrinkly leaves...'Variegata' features leaves edged in creamy white... and 'Krimson Queen'. 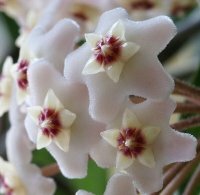 Other species of Hoya are available, but they don't produce the number and size of flowers as the carnosa species. H. bella is a small-leafed species. H. australis has smaller flowers that smell like honeysuckle. Sticky flowers? Hoya flowers are sweetly scented and may form drops of sticky nectar. This is normal. Give this plant time to adjust when you bring it home. You may not see many blooms on it until it is 2 or 3 years old, so don't give up on it. Dropped flower buds are often caused by soil that is too dry or too wet. Also, do not move the plant when buds are forming because changes in light may cause them to drop. Raising the humidity can help. Repot in early spring every 2-3 years or when it outgrows its pot. Wax Plant blooms best when almost pot-bound, so move it to a slightly larger pot (about 2 inches (5 cm) larger than the old one). Never repot a plant when it's in bloom because it may drop its flower buds. Hoya carnosa is a fast-grower. You can prune back long vines if you want to keep it compact. The best time to prune is early spring, before Hoyas start their most vigorous time of growth. Don't prune off the leafless stem -- or spur -- where flowers have been produced because flowers will form on the same spurs year after year. Wax Plant belongs to the family Asclepiadaceae -- the milkweed family. When cut, the stems may exude (just a little) milky, white sap. Watch for pests. Peaty potting mixes that are kept wet sometimes attract fungus gnats. You may find these fly-like critters crawling on the soil. Mealybugs may move in, too. Easy to detect, they are small, white and fuzzy. Spider mites are less common, but can cause more damage. Fine webbing between stems are a sure sign of this destructive pest. Cut off badly affected stems. If it's warm enough, take your plant outdoors (keep it shaded outside) and wash it off with tepid water to dislodge these mites. Otherwise, place it in the shower. Treat it with insecticide specially made for spider mites. Misting your plant regularly may prevent an invasion of spider mites that like dry air. And your Wax Plant will love the humidity. Winter care. 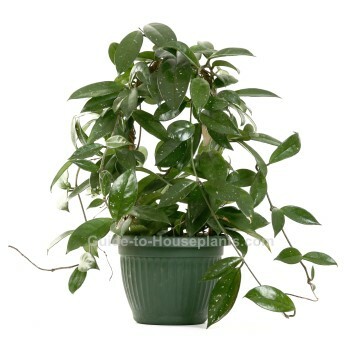 Hoyas do not go dormant in the winter, but growth slows down with lower light levels. One of the few problems with Hoya plant care is overwatering. Allow soil to dry out a bit between waterings in winter and stop fertilizing until spring. Maintain humidity, which can drop drastically in winter. Also keep your plant away from heat/AC vents. Blasts of hot air, especially, will dry out foliage and may cause flower buds to drop. This is a long-lived plant and easy to grow with little attention. Light: Bright indirect light year-round. Some direct sun is fine, but shade plants from harsh summer sun, which can scorch foliage. Hoyas will live in low light, but will not bloom. Artificial grow lights work beautifully. Put your Wax plant about 8 inches (20 cm) beneath the light and keep the lights on for about 14 hours a day. It's also important to give them darkness at night. Plants need a rest, too. Once your plant has formed flower buds, don't move it around. Changes in light levels can cause flower buds to shrivel up or fall off before they open. Water: Water thoroughly spring through fall, allowing potting mix to dry out a bit between waterings. 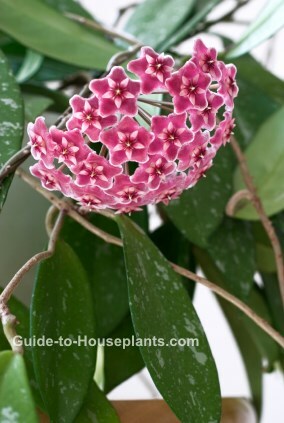 Flowering Hoya plants are thirsty, but don't like to sit in soggy soil. Be sure to use a pot with drainage holes and empty the drainage tray. Use room-temperature water for your tropical plants. Cold water can shock them. In winter, water sparingly giving the plant just enough to keep the soil from drying out completely. Humidity: Prefers 50% relative humidity. Use a room humidifier for best results. Or you can set the pot on a humidity tray. Misting the foliage with a fine spray of room-temperature water helps, but avoid getting the flowers wet. Temperature: Keep it warm year-round (65-75°F/18-24°C), with a minimum temperature of 60°F/16°C. Soil: 2 parts sphagnum peat moss-based potting mix with 1 part perlite added for better drainage. Fertilizer: Feed monthly spring through fall with high-potassium liquid fertilizer diluted by half. Propagation: Take 3 in (7 cm) stem tip cuttings in spring. Cuttings should include at least 1 pair of leaves. They will root easily in moist potting mix.